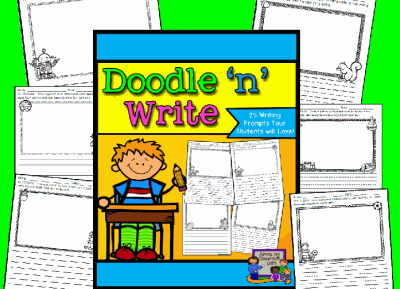 Your students will have tons of fun writing with this Doodle 'n' Write writing prompt set. Your students are giving directions to doodle something down in the box provided and then write to a given prompt. This helps those students who have a difficult time brainstorming, and they love creating the illustrations before they write. There are 25 writing prompts with lines for older elementary students and lines for younger elementary. Enjoy! What a fun way for your students to practice two and three-digit addition with and without regrouping! 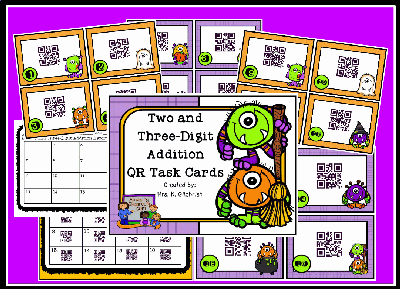 Your students will have a blast practicing addition with this fun, October themed, QR task card set. This file includes 16 task cards, a recording sheet, and and answer key for easy partner or self-assessment. Enjoy! 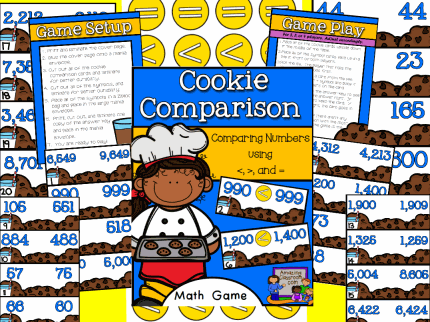 Your students will have fun comparing numbers to the tens, hundreds, and thousands, with this brightly colored and engaging "Cookie Comparison" game. This game features 32 different game cards, <,>, and = tokens, setup directions, how to play instructions, and an answer key. Use this in your math centers or stations for 2, 3, or 4 player fun. Enjoy! Your students will get tons of practice with this 32 problem greater than, less than, or equal to activity page. 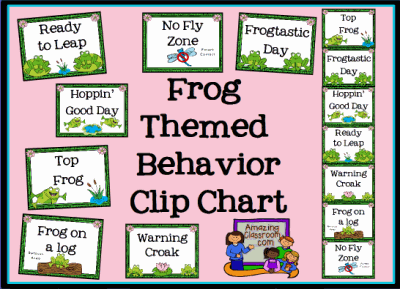 Use as homework, guided practice, or even a formative or summative assessment. An answer key is included for easy grading. Enjoy! Can You Find the Largest Number? Sometimes students have difficulty comparing numbers when the numbers look similar. 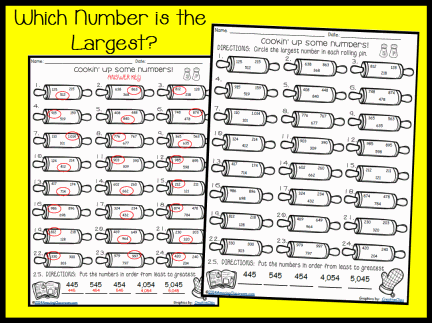 Use this worksheet to help students practice finding the largest number in a set of numbers. Students will need to look carefully before circling their answer. 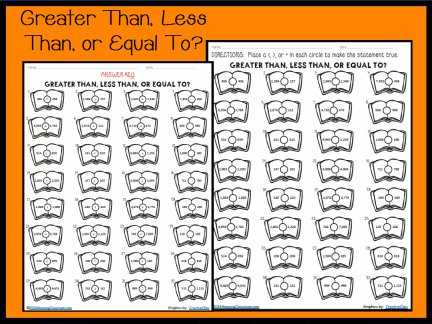 There is a bonus question for students to put numbers in order from least to greatest. There are a total of 25 questions, plus an answer key for easy grading. Enjoy! 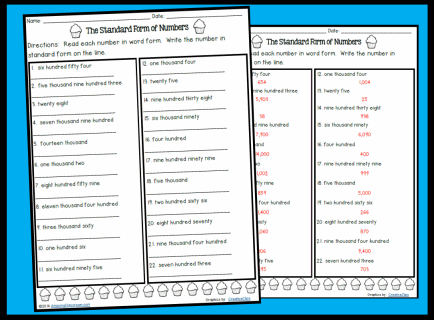 Have your students practice writing numbers in standard form with this standard form activity page. Use this as homework, guided practice, or even as a formative or summative assessment. 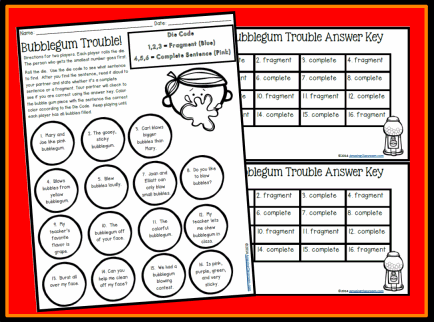 This activity page includes 22 problems with an answer key for easy grading. Enjoy! Your students will be sure to be able to identify complete sentences or sentence fragments after playing this fun, partner game. Students will roll the die, choose a group of words, read them, and identify them as a sentence fragment or complete sentence. Their partner will check their work with the answer key. Continue playing until all bubbles are colored in. Do you want other students or staff to be able to find you when you are out of the room? 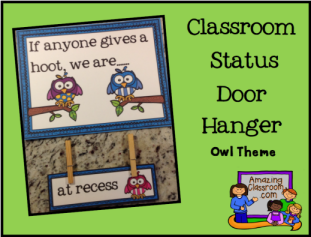 This cute, owl themed, door hanger will help! Just hang up the sign, "If anyone gives a hoot we are in....." on your door and use clothespins to attach the school areas underneath. Make it a student's job to change the location of your class each time you leave the room. Enjoy! 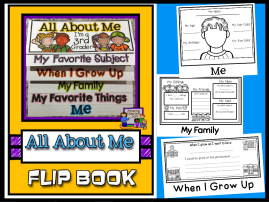 This All About Me book is an easy and fun way for your students to get to know each other at the beginning of the year while sharing some of their best traits with you and others! There are six tabs total in this flip book. Each tab has pictures and/or a writing area for students to color and write about themselves.